HP ProBook 4720s (WT237EA/WS912EA): Matte 17 inch notebook with mid-range power. An office all-rounder for demanding users? 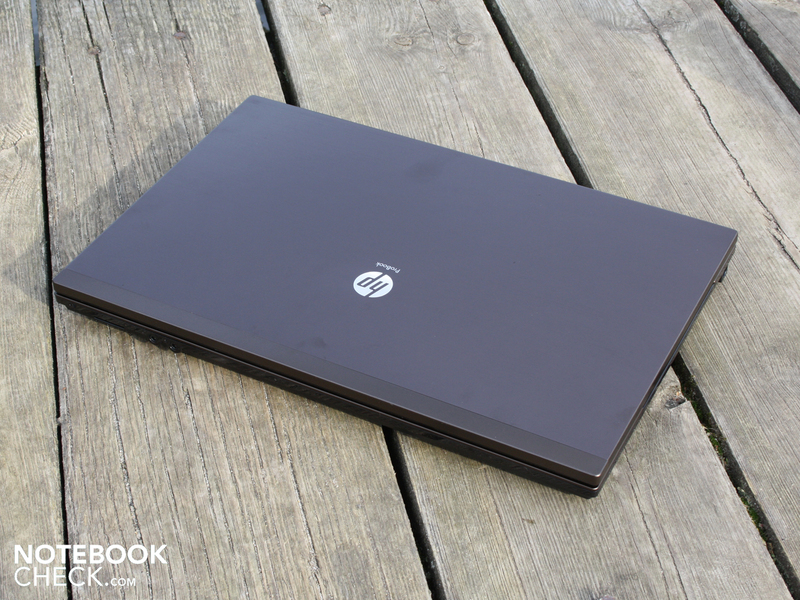 HP's ProBook series has proved itself on several occasions in our previous tests. The 13.3, 15.6, and 17.3 inch models can impress thanks to a robust and insensitive construction (build and surfaces), high number of interfaces, and in some cases very good displays, as well as input devices suited to frequent typists. But a ProBook is not always necessarily a ProBook. The manufacturer HP for example provides the 6550b, the 6555b, and the 6540b, for hardened austere business professionals. 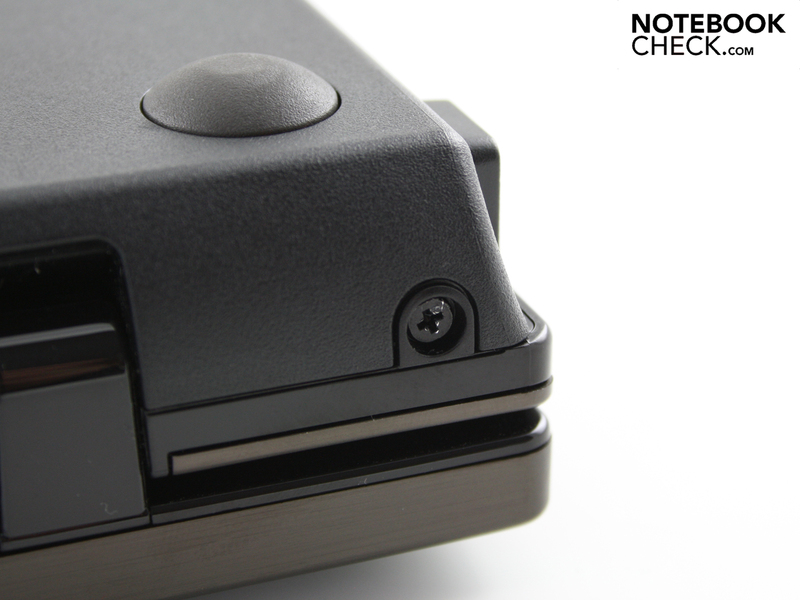 In these cases most interfaces as well as a docking port are included, and the surfaces are insensitive. For customers with a tendency towards design and a trifle of exclusivity (at least in the otherwise boring office), there are the elegant ProBooks such as the 5310m, the 4710s, and the 4510s. These models don't have the aforementioned business features such as a docking port or the diverse number of interfaces though. 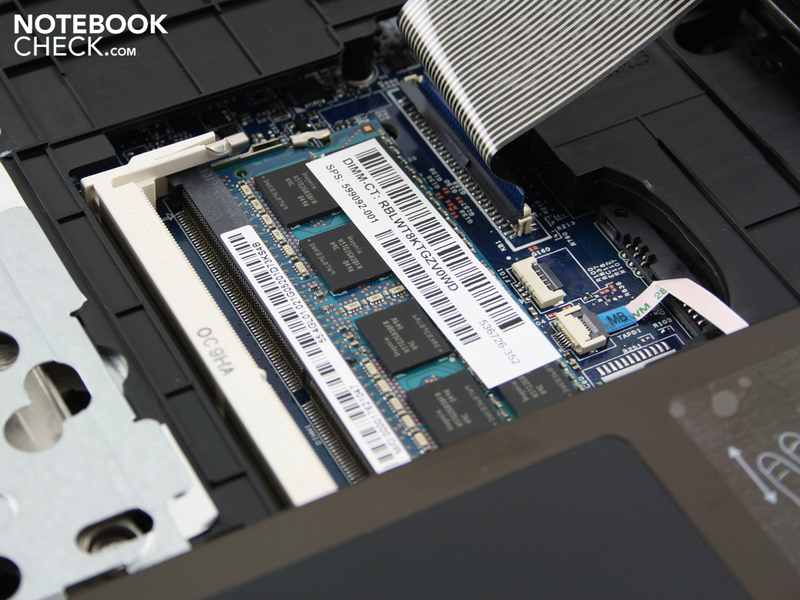 The ProBook 4720s (WT237EA/WS912E) belongs into precisely this elegant category. 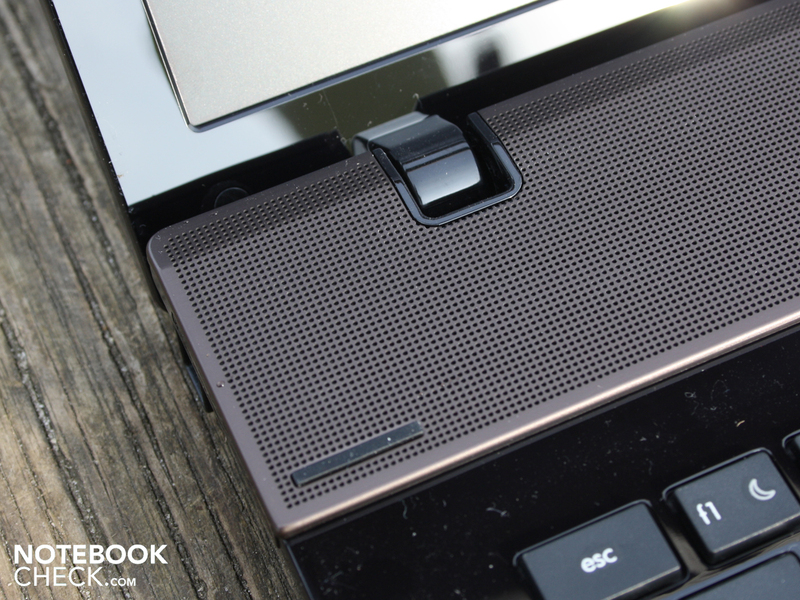 Glossy surfaces surrounding the keys and an absence of a docking solution are not ideal for demanding users. Who is this design object targeted towards? Can a demanding users be satisfied for 675 Euros? Are the input devices suitable for working? How do run times and performance measure up to each other? Is the build only geared towards the aluminum style, or does it provide tangible advantages in terms of stability and durability? All the answers can be found in this review. Aluminum materials, combined with a little gloss makes for an elegant office look. 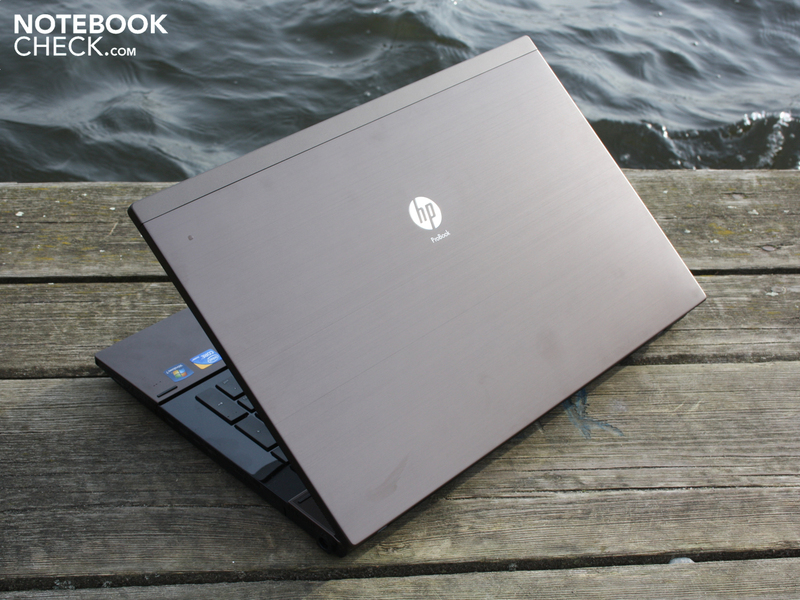 The matte brown brushed aluminum finish with the addition of an HP logo on the display lid, makes a restrained and elegant impression. The case does away with rounded edges, and makes a good impression with its massive character. The inside combines the same matte brushed aluminum, with glossy black surfaces, and matte plastic keys. This doesn't provide for a fingerprint free zone though. Already after a few hours of intensive use, all the surfaces are covered with greasy fingerprints - even the hand resting area. The fingerprints eventually turn into scratches, and then abrasion. There could be a lengthy discussion regarding personal taste, but whether such embellishments make sense for a work laptop is debatable. The edgy shape makes a robust impression. 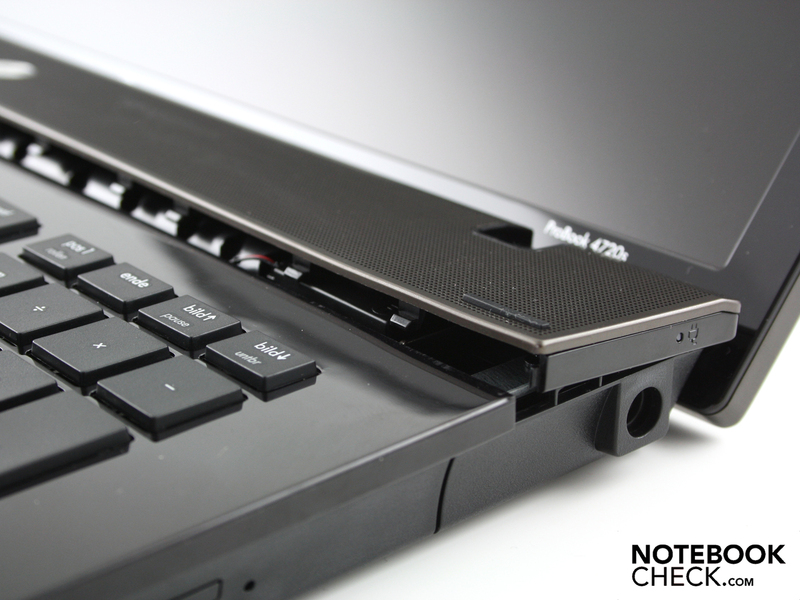 When closing the notebook users will notice that the case can be warped marginally though. The wide lid for example can be significantly bent holding both corners, and its surface easily dents with a little pressure. The firm hand resting area in contrast has none of the aforementioned issues. The surface cannot be dented anywhere, not even with a lot of pressure. The same is valid for the bottom surface. The plastic base has no openings, since the components are accessible from the top after removing the keyboard (see series of images). The missing maintenance panel provides improved stability, and we were only able to dent the surface below the optical drive. 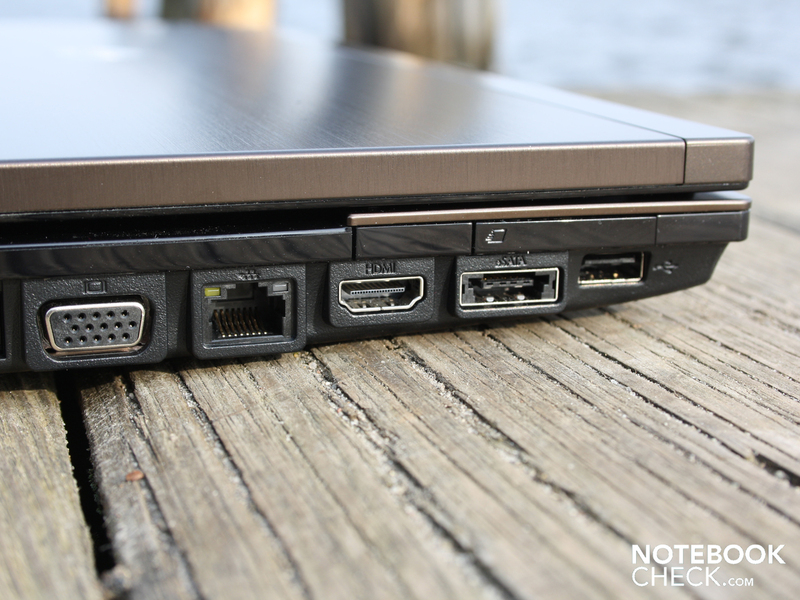 When it comes to the connectivity options the ProBook 4720s is politely restrained, since it omits a series of ports that are included with the high quality Pro- and EliteBooks. These are for example a DisplayPort, modem (RJ11), and FireWire/iLink. 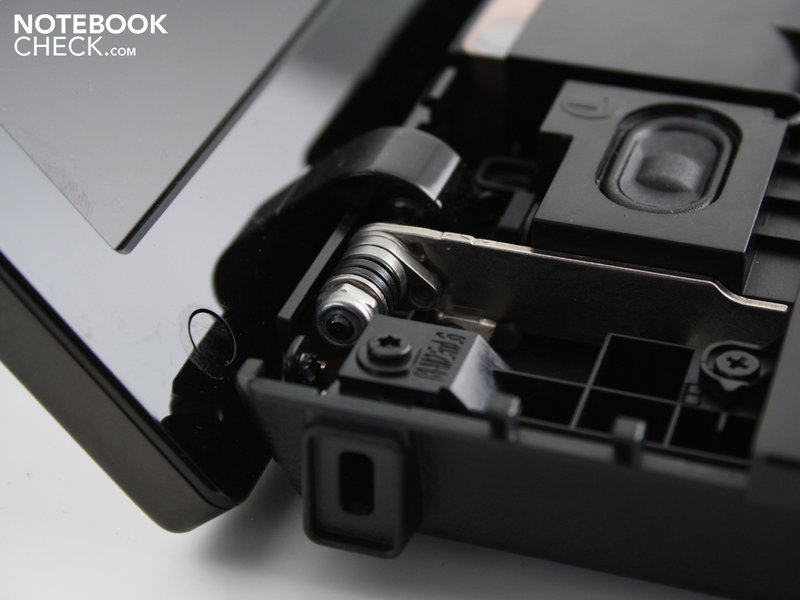 Professionals will already decide against the purchase of the tested device due to the absence of a native docking port, which is included as standard with most ProBooks and EliteBooks. 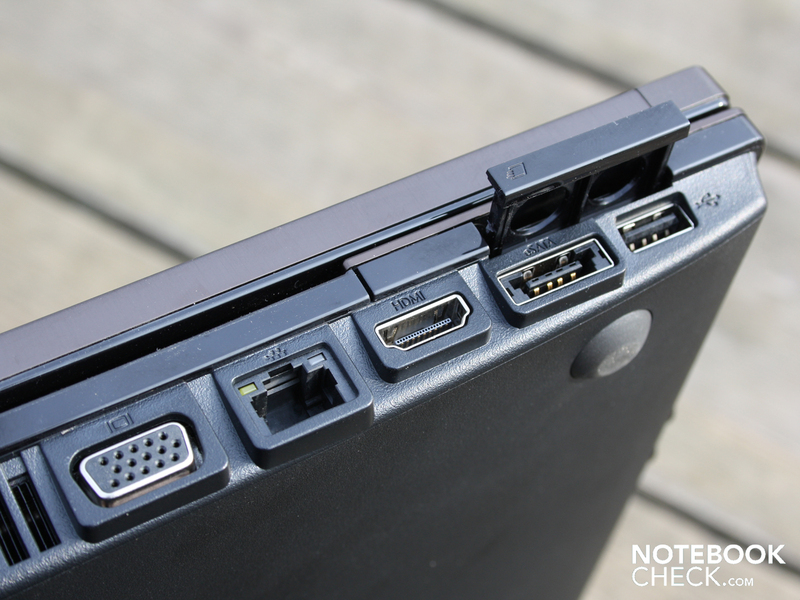 The missing docking port is not a tragedy though, as long as the user doesn't intend to move the 17 inch notebook often, or doesn't intend to use a large number of external devices such as TFT (VGA), USB printer, eSATA hard drive, or HDMI for a TV. Assuming a given set of external devices is used though, the desktop will soon be cluttered with a series of cables, since all the interfaces are unfavorably located at the front of the notebook on the left and right sides. Interfaces at the back are not possible due to the overhanging display lid. A positive aspect is the ExpressCard34 shaft. This provides an opportunity for inserting expansion cards (interfaces, TV cards, flash memory). 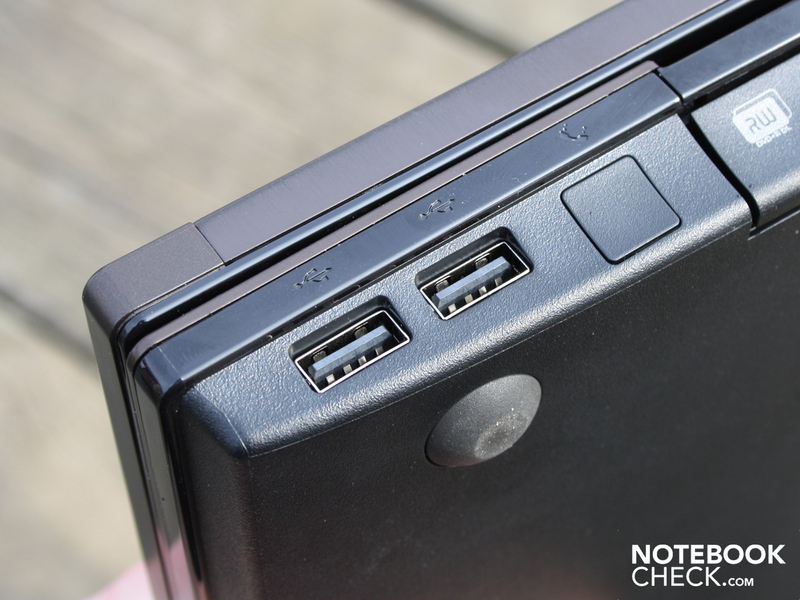 The audio sockets as well as the card reader are located at the front of the notebook. With the Ralink RT3090 Draft-N Wi-Fi adapter including Bluetooth 3.0 + HS, the 4720s is up to date with the latest developments in terms of wireless communications. The same is true for the webcam, which has a good 2 megapixel resolution (photographs up to 1600 x 1200 pixels). 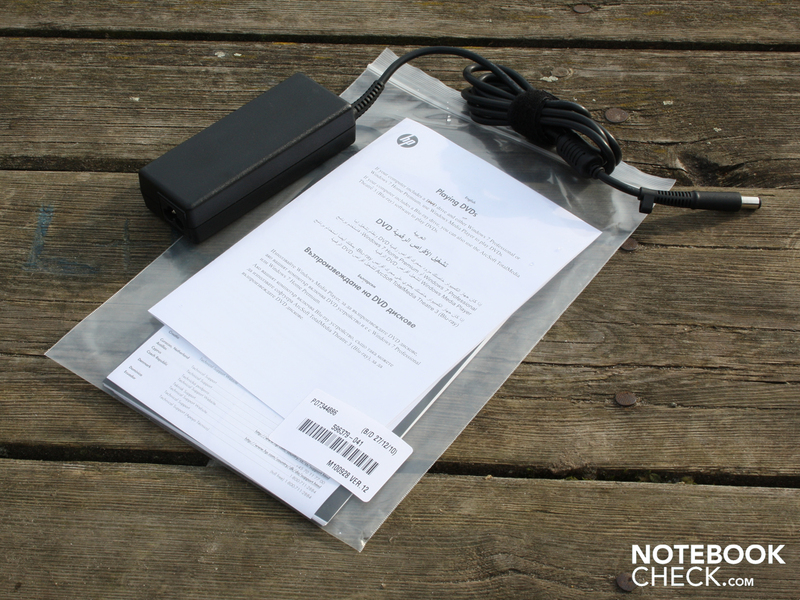 Typically current notebooks are only fitted with a webcam that has 1.3 MP, or even a mere 0.3 MP. The webcam turns out to be very light insensitive as is so often the case. Using the maximum image quality the picture noise is very strong, and due to the long exposure times only still objects can be successfully photographed. 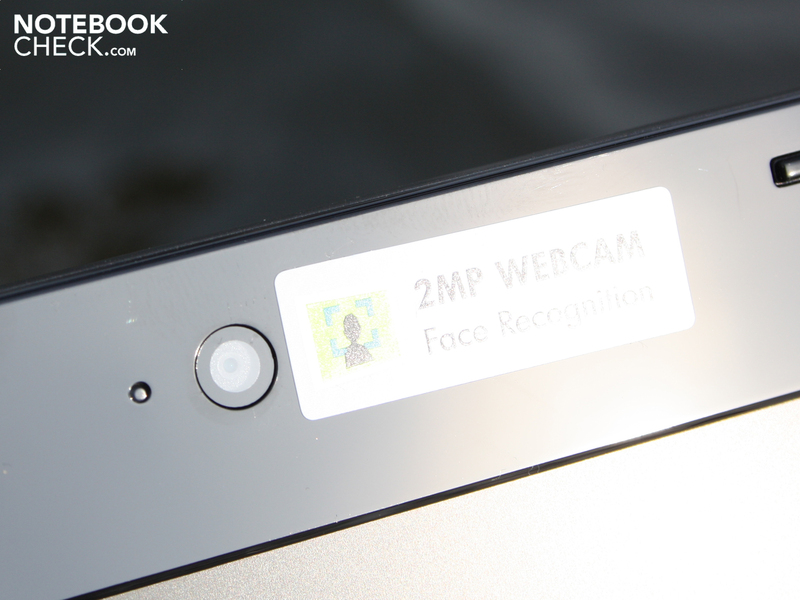 The Face Recognition feature allows the webcam to recognize faces, and can be used for logging in (HP Protect Tools). 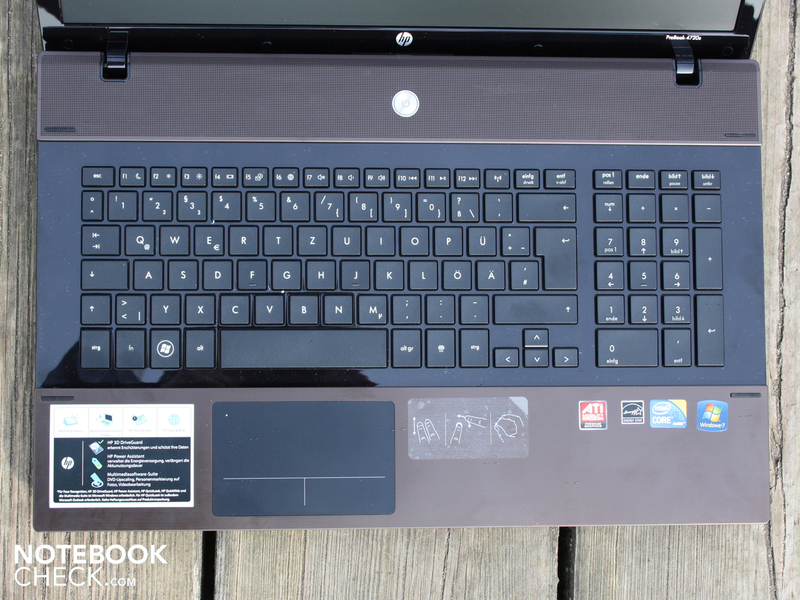 Using a series of HP-Tools users are able to configure the notebook and security features. The HP Protect-Tools for example contain the Password-Manager, File Sanitizer (data shredder), Encryption or login information (e.g. via face recognition). The HP DriveGuard recognizes abrupt movements or impacts via a sensor on the hard drive and retracts the read/write heads into the park position. Those that fear theft and loss of data can equip the 4720s with Computrace LoJack Pro (additional cost), which is supported by the notebook. For all the comprehensive tools available, we will only cite some of them here. HP Power Data gathers data relating to power consumption, and HP Wireless Assistant is a manager for wireless connections. Last but not least HP QuickLook, which shows the Outlook calendar and E-Mails while the notebook is hibernating or switched off, came to our attention. Not native to HP there is ArcSoft Total Media Suite. The full version bundles media player, simple editing program, DVD burner, audio player/ripper, and picture management. Windows Home Premium or other media are not included, and as usual users will have to create their own Recovery DVDs. 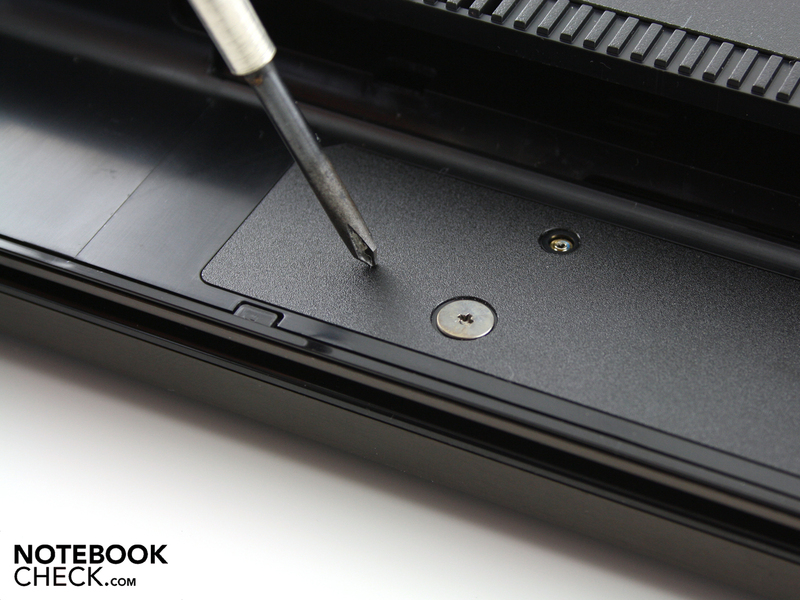 As standard the ProBook is provided with a one year warranty with send-in-service. In addition there is also one year of warranty on the included battery. As usual for business devices, HP Care Packet can also be acquired. Small packages lasting a year are available, as well as ones lasting for five years. As well as differing in terms of the length of the package, these also differ in terms of the scope of cover. There are packages for accidents, collection of the notebook on the next working day, or for an in situ service. Security Manager / Face Rec. The keyboard invites typing. The keys lie on a firm base, with the exception of the alphanumeric keypad (above the DVD drive). The distance between the keys is large and therefore well suited for blind typers. In addition to this there is also a noticeable pressure point, a clear key travel, and a firm but not hard end stop. Even users of arrow keys and the calculator (via alphanumeric keypad) don't have to look at the keyboard for once. The arrow keys may be small, but are clearly separated from the other keys. The alphanumeric keypad keys have the standard desktop keyboard size and layout. 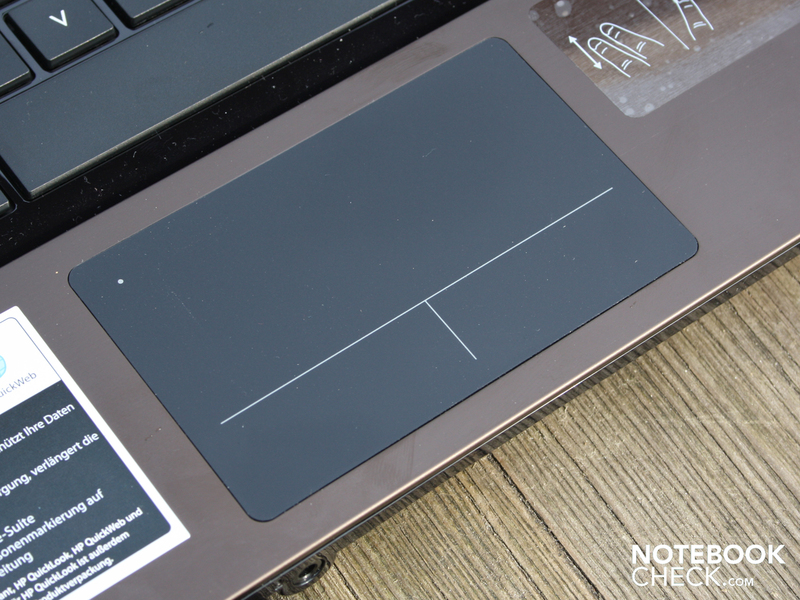 This input device is called ClickPad by HP. It is constructed like a seesaw and can be pressed down at the front where the buttons would be. This is where the "mouse buttons" are marked. The multi-touchpad with support for gesture control allows scrolling, zooming, grabbing, and tilting with two fingers. The surface is matte, but has the tendency to be on the slippery side. Exact control of the mouse pointer isn't a problem, but the mouse buttons beneath the seesaw are a cause of concern for us. Since these are also part of the same surface, once in a while a mouse click fails because the cursor jumps down when the second finger touches the "button". This problem can be avoided with a little practice and modifications to the touchpad software, although the stubborn buttons remain. The travel is short, and the pressing of the "buttons" requires too much pressure in our opinion. Compared to the easy to operate buttons in the 6550b and the 6555b this touchpad is a step backwards. 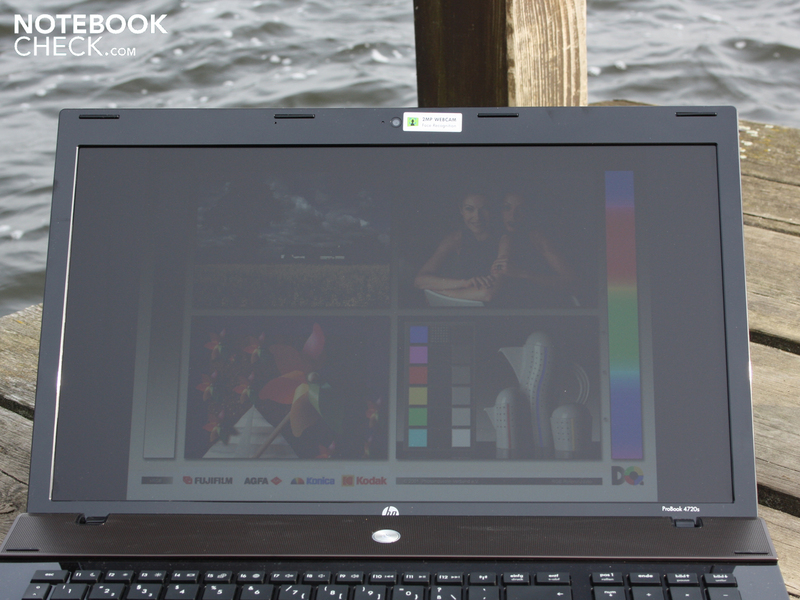 The WXGA++ display on the ProBook 4720s has a relatively fine resolution of 1600 x 900 pixels. The LG panel (type LP173WD1-TLD3) is non-reflective, which is why users don't have to worry about reflections. For the requirements of a workplace notebook the panel is therefore a suitable display. High contrasts for the color representation of pictures, tables, and text are not available though. We measured a black level of 1.08 cd/m² (middle) with the maximum brightness. This is a meager contrast of 185:1. The appearance of the colors is correspondingly pale and washed out. The color space cannot keep up with AdobeRGB (t) or sRGB-Displays (t) by a long shot. The sparse number of representable colors is in line with most consumer laptops. The LED backlight of the 17.3 inch display illuminates the panel up to 200 cd/m² in the middle. For use indoors this more than enough, since the average value lies at 195 cd/m². With the matte panel but a low brightness level of on average 195 cd/m², the 17.3 inch display can only be used with favorable lighting conditions and without direct sunlight outside. 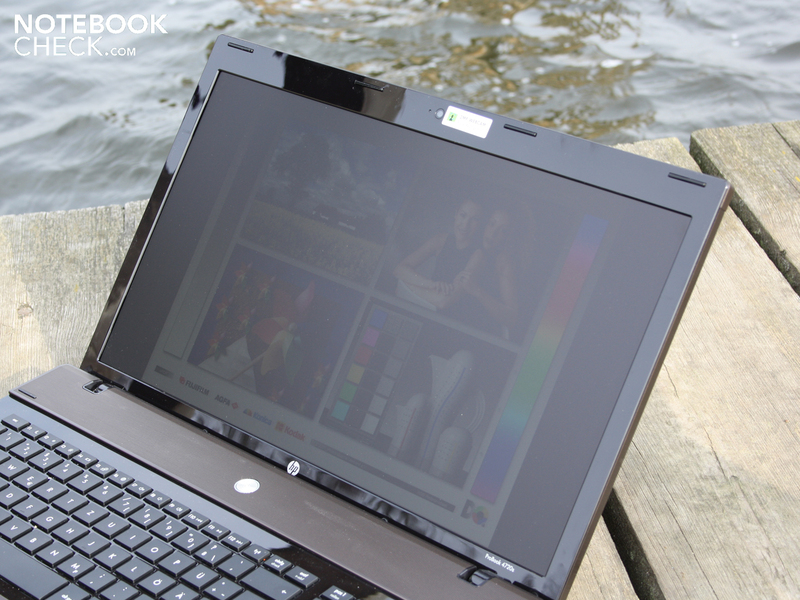 Direct sunlight causes a too dark desktop, even if the luminance is not dimmed when powered by the battery. 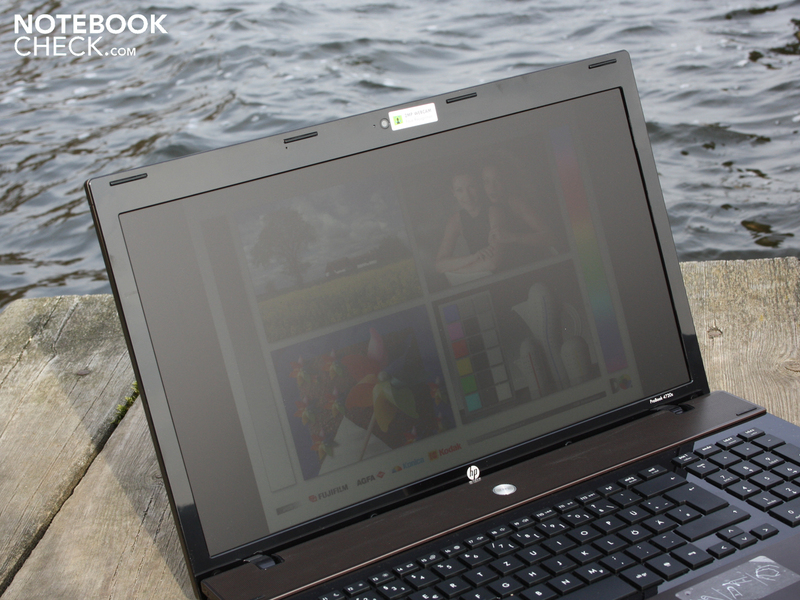 This ProBook is therefore less suited for use in the park or a cafe, although the matte display provides a good basis for not having any reflections on the display at work. Within work suited viewing angles users can recognize colors and writing from the sides and above using a constant level of brightness. Office notebooks typically have very narrow viewing angles, especially in the lower and middle price ranges up to 800 Euros. The ProBook unfortunately doesn't make an exception in this case. Vertically the eyes can only deviate up to 15 degrees, after this the colors are already clearly inverted. Horizontally the effect only occurs very slowly, which is why colors remain unchanged up to a deviation of 50 degrees. Reading text is perfectly possible up to 80 degrees though. 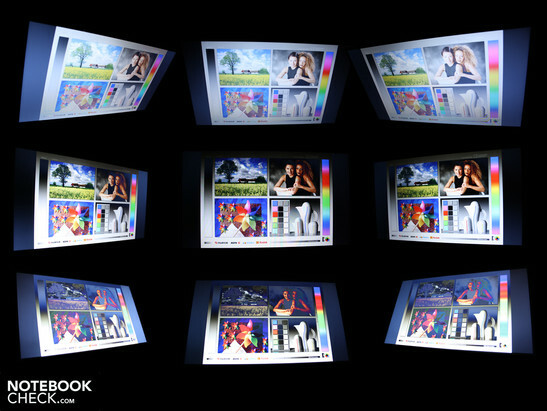 The color stability of a desktop TFT can't be provided by the ProBook. 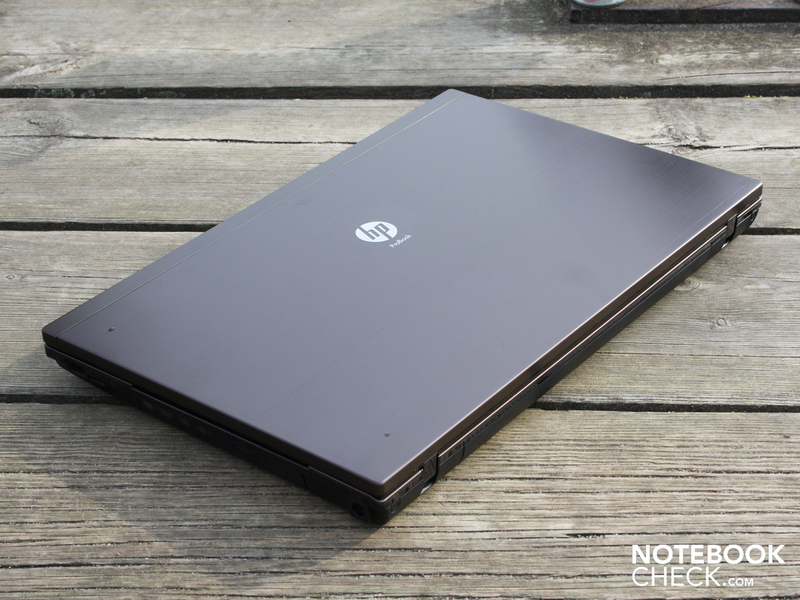 HP has fitted the ProBook with an Intel Core i5-460M (2 x 2.53 GHz). Compared to the first Arrandale chips of from 2010, such as the i5-430M (2 x 2.26 GHz), there has been a slight increase in clock speeds. The L2/L3 cache (512KB/3MB) has remained identical. An Intel HD graphics unit, as well as a memory controller for DDR3-800/1066 RAM are also aboard the CPU. The Intel HD in the tested device is however deactivated in favor of an ATI Mobility Radeon HD 5470. Many shops list the tested device with an HD 4330, which is not included in our device though. The clock speed of the 460M sways with Turbo-Boost between 2.53 and 2.8 GHz (Turbo-Boost). In addition to this there is also Hyper-Threading, which provides the two physical cores with additional virtual cores. Applications can therefore process up to four threads. Our 4720s can keep up with the competition fairly well with its i5-460M: The processor test Cinebench R11.5 (64-bit) provides the tested system with a score of 2.29 points. 520M-CPUs are a little weaker with 2.2 points (2.4 GHz standard clock speed). A 430M comes to 2.0 points. Using single core processing the 460M prevails over the slower 430M (2.26 to 2.53 GHz). The latter of these reaches up to 3.362 points (Cinebench R10 single core 64-bit, Sony Vaio VPC-EB1S1E/BJ). The 460M in the 4720s reaches 3.648 points. Compared to the 520M (3.624 to 3.815, Lenovo Thinkpad T410s; Asus G73JH) the 460M falls behind though. The PCMark Vantage benchmark gives a good idea of how fast users can work with the 4720s. Its score visualizes the application performance. With 6221 points the ProBook has been able to prevail over high performance devices such as the Apple MacBook Pro 17 inch 2010-04 (540M, GT 330M: 5749 points) or the Acer Aspire 8943G (720QM, HD 5850: 5717 points) thanks to its powerful processor and the fast hard drive. 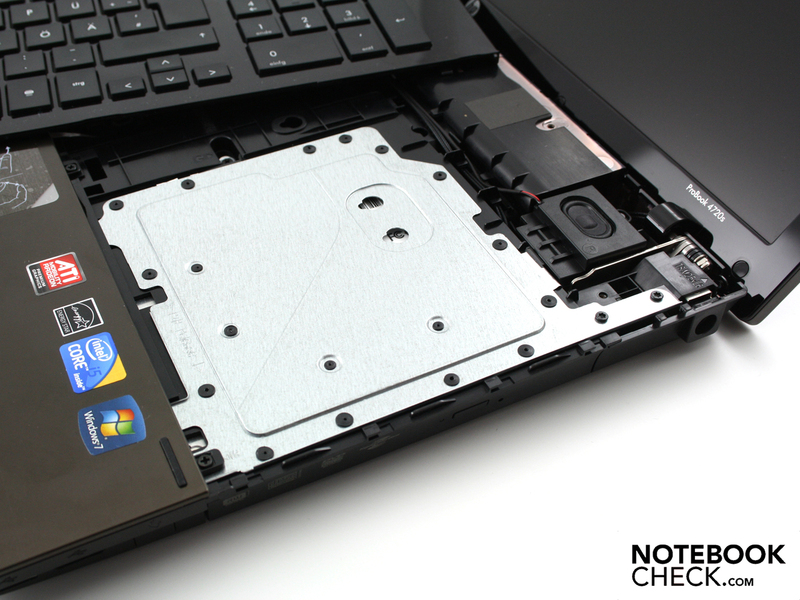 The cause of the advantage is the 7200 rpm hard drive, for further details see the HDD section. The Vantage benchmark also gives an indication of the gaming performance. The gaming sub-score lies at 4584 points. 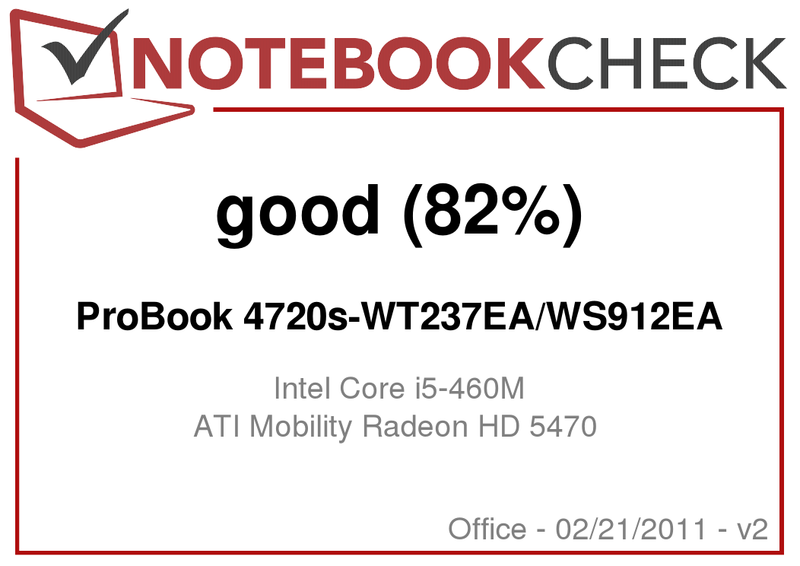 This is clearly below the 5376 points that the Acer Aspire 3820TG with an ATI HD 5650 achieved. Using 3DMark06 we determined a meager 3808 points. Even an old Nvidia GeForce GT 325M with a clock speed of 450 MHz manages to achieve 5333 points. The ATI Mobility Radeon HD5470 has 512 MBs of GDDR3 video memory, and is classed as entry level mid-range by AMD. The memory has a clock speed of 800 MHz, while the core has a clock speed of 750 MHz. The GPU supports DirectX-11 effects, which can hardly be activated in games due to its weak performance though (most with details set high). 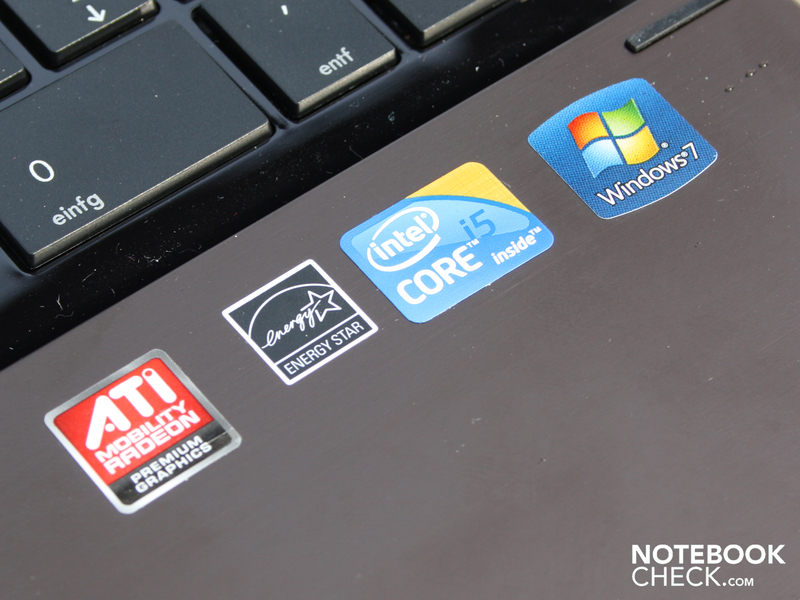 Gaming tests with the HD 5470 have been carried out by us in several notebooks, such as the Asus K52JR and the Acer 5741G. The tests showed a less than favorable gaming performance, particularly for current and demanding games. The data sheet for the HD 5470 provides more detailed information about which games work how well. The fast 7200 rpm hard drive from Seagate (ST9500420AS) with its 500 GB of total capacity makes itself noticeable as a performance enhancing component of the system. The HDD reads data with 79 MBytes/s in sequential mode from the disc (HD-Tune). The Crystal Disk mark, which uses a different test routine, even comes to 90 MBytes/s when writing. This leads to a very good rotating single hard drive HDD Score in PCMark Vantage of 4169 points. Typically 5400 rpm HDDs only reach a maximum of just about 3000 points. 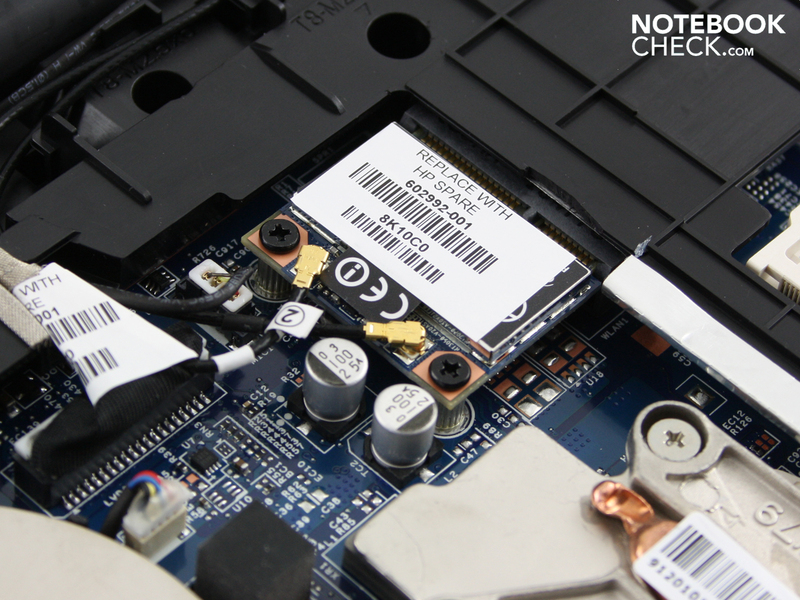 The system noise is one of the weak points of the ProBook 4720s. This is not only the case under maximum load, but also in an idle state. With energy saving activated the system noise stays constant at 33.1 dB(A) in idle. 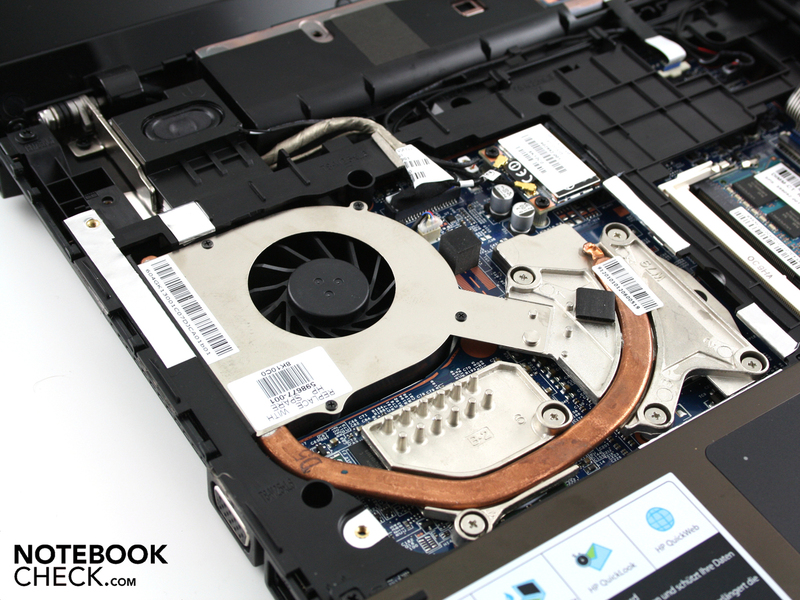 The cooling fan may not be deactivated at any time, but the measured noise originates from the 7200 rpm hard drive. The cooling fan has a quieter sound level than the loud HDD. The constant noise of 33.1 dB(A) would be bearable, if it wasn't for the consistent droning that comes with it. 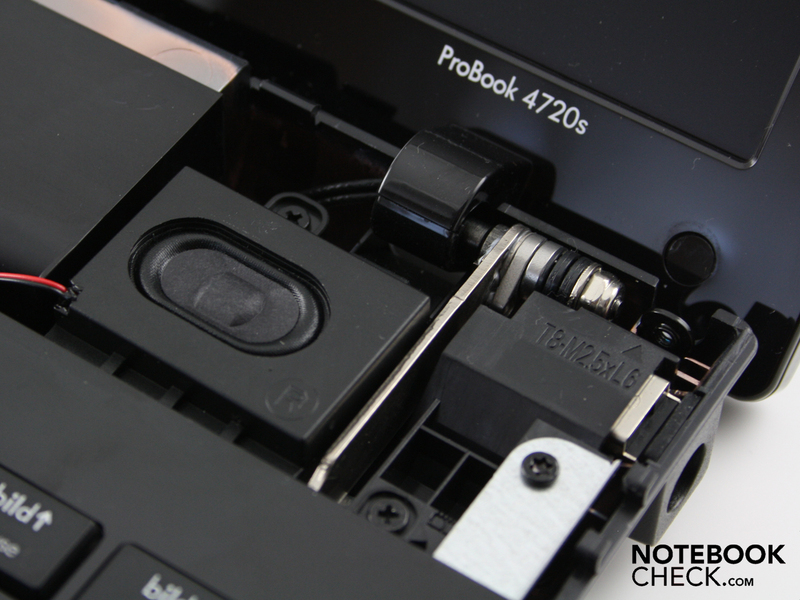 The 7200 rpm generate a vibration that is transferred via the notebook feet to the table top. This can then not only be heard by the user, but also felt very gently on the forearms. 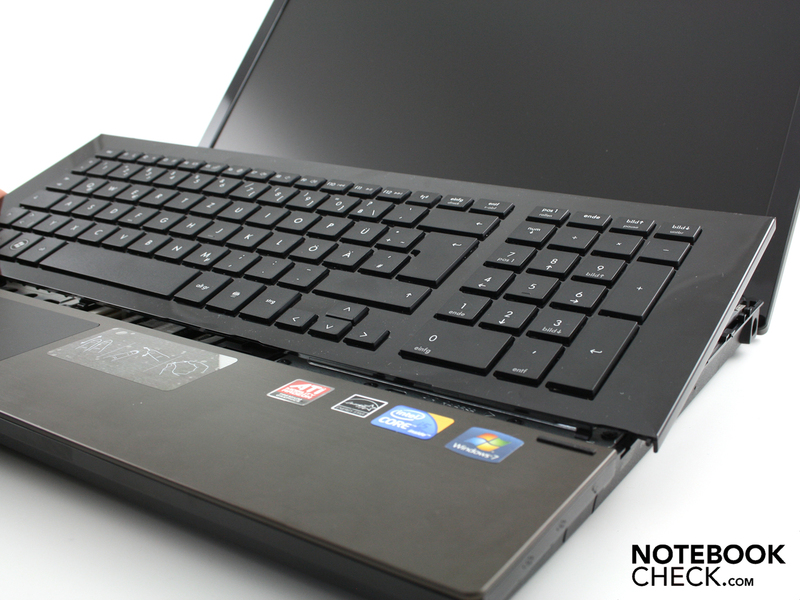 The vibration only stops when the laptop is placed on a soft surface (decoupled). Using our 3D benchmarks the volume increased up to 44.1 dB(A). This is valid for applications which exert the graphics performance in particular. When the CPU also runs at its full potential in addition (stress test), then the noise level even rises to 53.3 dB(A). This is already a deafening level, which can however only be reached by constant maximum load (Furmark & Prime95). The speed of revolution of the cooling fan varies smoothly between the individual states. After coming out of a load state the noise level dropped back down to 33.7 dB(A) within 20 seconds (base level). Do the temperatures at least stay low with so much noise under a high load? This is the case, at least for most areas on the top and bottom surfaces. Following a several hour stress test we were able to raise the heat dissipated from the surface to 44 degrees Celsius in some places. The maximum surface temperature we measured was directly on the heat pipe. All the other areas remained, even under a stress test, considerably cooler. Thus the base plate has an average temperature of 32 degrees. The work area shows an even rosier picture: 25 degrees (average). The warmest point doesn't exceed 29 degrees. The processor temperature increased to up to 81 degrees during the stress test. The ATI GPU had a similar temperature of 83 degrees. These innocuous values show that the cooling system has a good grip on the temperatures. While word processing and web browsing the average temperature on the base plate lies at about 23 degrees. The hand resting area meantime also remains in the blue area with approximately 24 degrees. (+) The average temperature for the upper side under maximal load is 25.4 °C / 78 F, compared to the average of 29.4 °C / 85 F for the devices in the class Office. (+) The maximum temperature on the upper side is 28.8 °C / 84 F, compared to the average of 33.9 °C / 93 F, ranging from 21.2 to 62.5 °C for the class Office. (+) In idle usage, the average temperature for the upper side is 23 °C / 73 F, compared to the device average of 29.4 °C / 85 F.
(+) The palmrests and touchpad are cooler than skin temperature with a maximum of 25.3 °C / 77.5 F and are therefore cool to the touch. (+) The average temperature of the palmrest area of similar devices was 28.2 °C / 82.8 F (+2.9 °C / 5.3 F). The speakers in the ProBook sit above the keyboard, and sometimes make quite a racket when turned up to their maximum. The playback during a presentation in a meeting room is therefore not a hurdle - even if the sound is not especially good or balanced. The sound emphasizes the mid-range and partially also the high frequencies. The sound scape is not well defined and low frequencies are not audible. 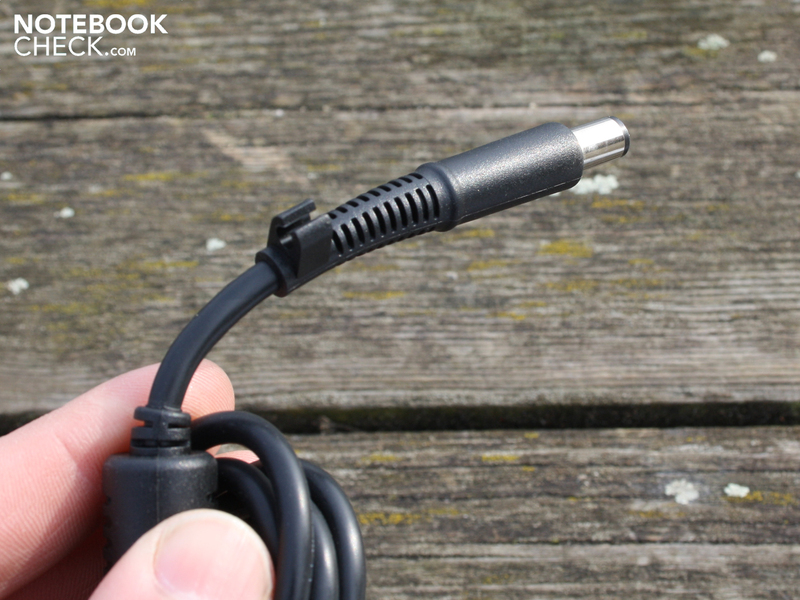 The connection to external speakers via the 3.5 mm socket is obligatory for listening to music. We tested this with two Yamaha speakers (YST-M20SD). The IDT 92HD81B1X audio controller integrated into the chipset offers a high output signal, which contains hardly any noise. 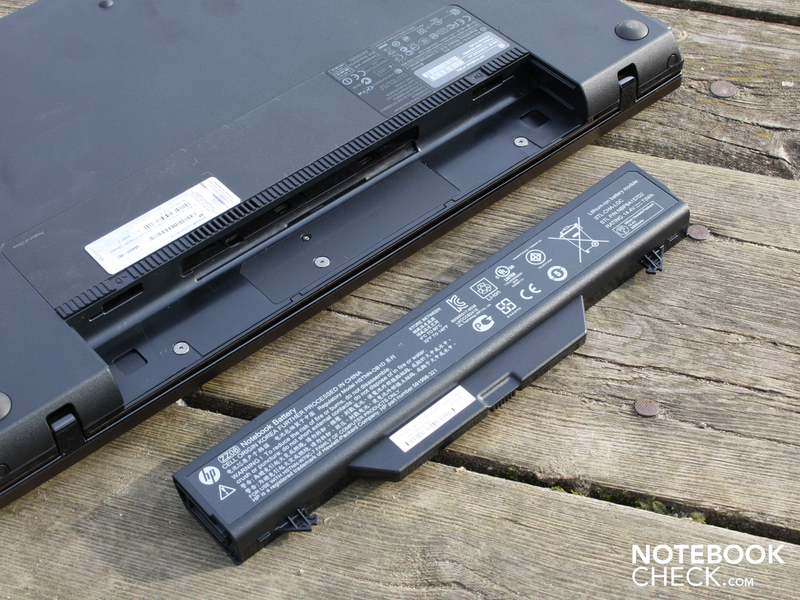 The 17.3 inch 4720s is equipped with a 73 watt-hour battery (5000 mAh). This keeps the ProBook on its feet for a surprisingly long time, especially when the processor and the graphics are only used marginally or not at all. During a WLAN surfing session we determined a run time of 4.37 hours (277 minutes). During these four and a half hours we visited news portals and operated the display with a brightness level of 100 cd/m² (medium setting). Options for battery slices or additional battery packs are not available for the 4720s. The maximum but unrealistic run time that we determined with BatteryEater's Reader Test was 408 minutes (6.48 hours). The brightness of the display was set to its minimum for this test, while all the wireless modules were inactive. This battery life is unrealistic in practice since the CPU and the graphics permanently stay in an idle state. A movie on a DVD in contrast only runs for 187 minutes. The brightness was set to 100 cd/m² during these 3.07 hours, and the wireless modules were inactive. The battery requires three hours (136 minutes) for a complete charge. 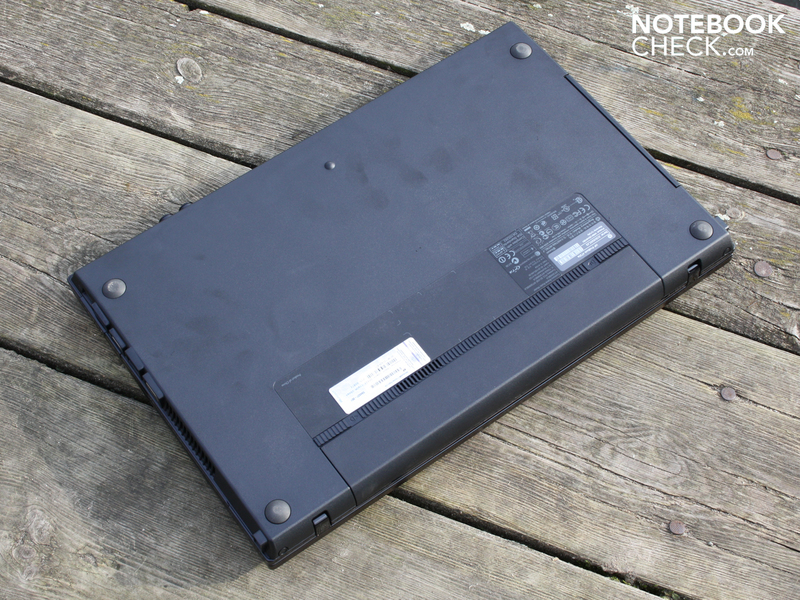 The ProBook 4720s has a low power consumption for a 17 inch laptop. Economical office aficionados that switch from a desktop PC to a notebook, will be pleased with the idle power consumption. While a desktop consistently eats through 50 Watts, the 4720s comes to terms with 13 to 19 Watts. The lowest value is reached when all the power saving options are utilized, and the luminance is set to its lowest value. Under load the power consumption rises significantly as expected. The HD 5470 together with the whole notebook requires 50 Watts during the 3DMark2006 benchmark. The maximum power consumption was determined during our stress test with Prime95 and Furmark. The multimeter now showed 71 Watts. The 90 Watt AC adapter is therefore appropriate for the device. The HP ProBook 4720s - WT237EA/WS912EA doesn't seem to know exactly where it wants to go. With the ProBook in its name it actually alludes to full fledged business features, together with a high level of day to day suitability. 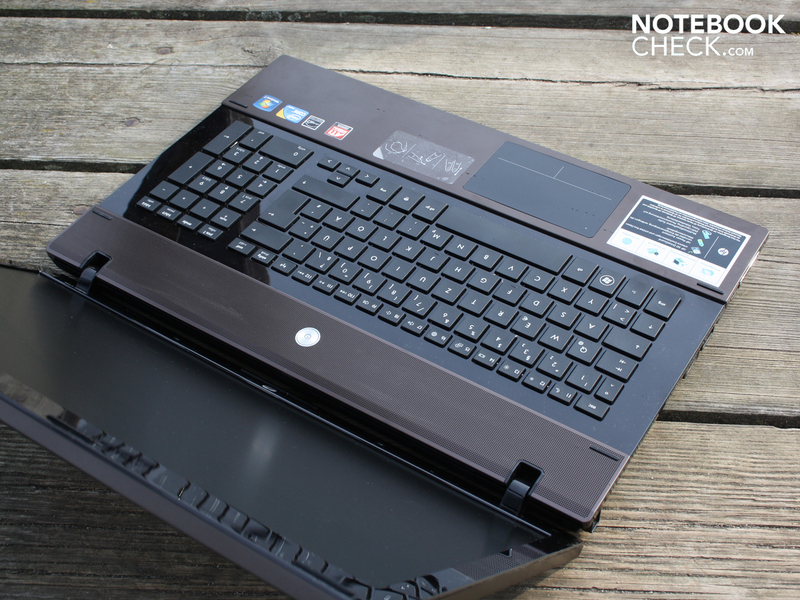 What we have discovered though, is not significantly more than a consumer 17 inch notebook with a matte display. The absence of many business features, such as a docking port, multiple interfaces, and first class input devices, didn't surprise us due to the relatively affordable price. 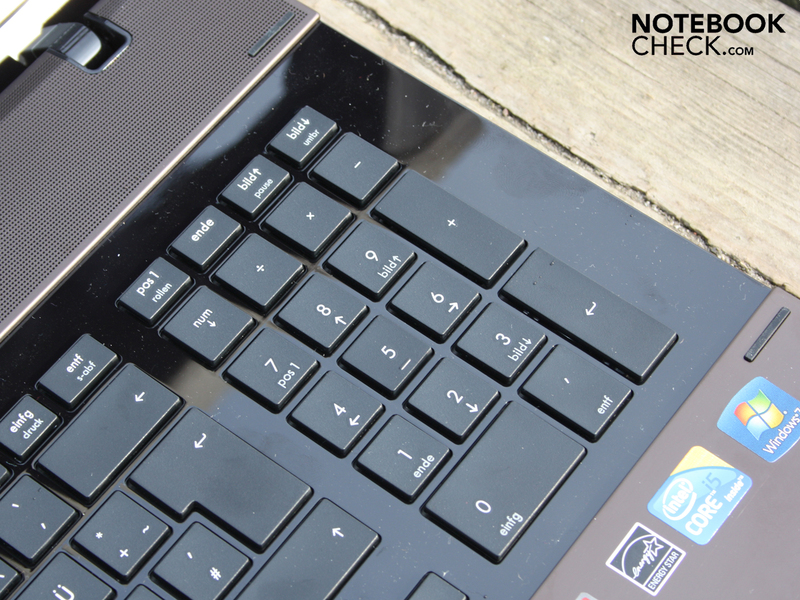 But a stubborn touchpad and glossy surfaces around the keyboard were certainly not necessary. Whether demanding consumers are keen on the glossy finish on the inside surfaces, or prefer more sober and scratch resistant surfaces, is not really a question of taste considering the device class. 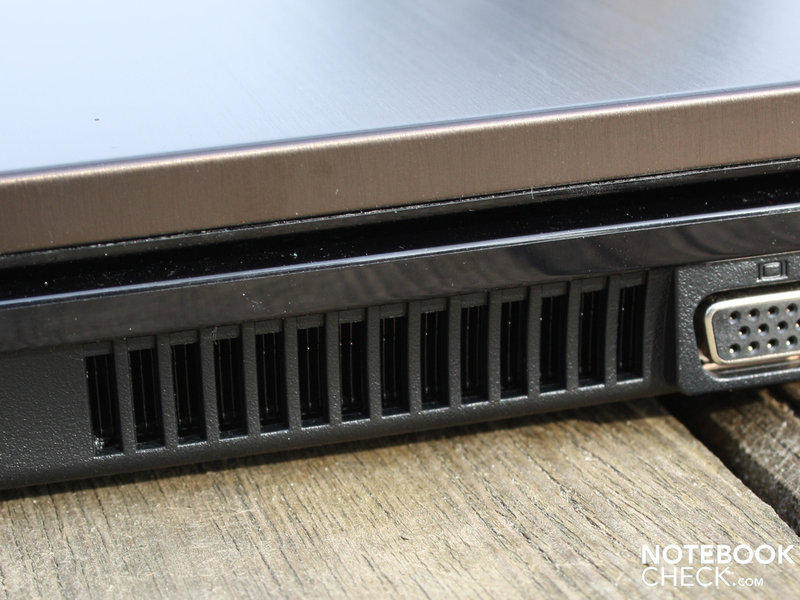 Our opinion is that a laptop with ProBook in its name doesn't require these types of "embellishments" without losing favor in the eyes of buyers. The advantages include the high resolution non-reflective display panel (1600 x 900 pixels), and the good performance combination made up of the Core i5, fast 7200 rpm hard drive, and entry level (consumer) graphics card. Unfortunately it is precisely the fast HDD that provides for constant vibrations which are transferred to the table top. These can be felt by the user in the forearms, while the faint droning can be heard. The keyboard overall provides good feedback, and a good layout with an alphanumeric keypad. The full surface touchpad (seesaw) however has a short travel, and is hard to press. In addition to this the all-sensitive surface causes entry errors from time to time when pressing the "mouse buttons". The interfaces provide for satisfactory expansion options with ExpressCard34 and eSATA. A real professional would however also provide a DisplayPort, USB 3.0, and a docking port. The location of the ports towards the front on the left and right sides is particularly unfitting in our opinion. In case these are utilized, then a less than ideal mess of cables on the desktop is almost unavoidable. 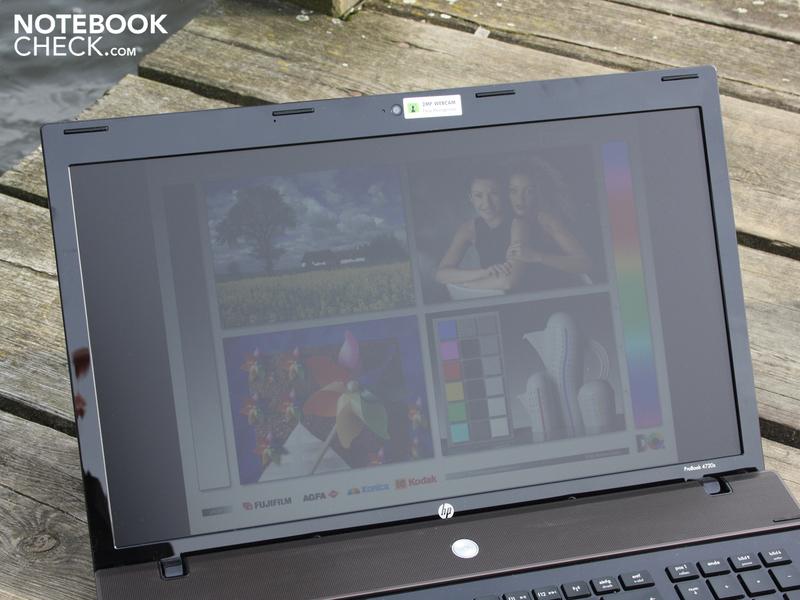 HP ProBook 4720s-WT237EA/WS912EA: Eines der günstigsten ProBooks, aber mit Schwächen bei der Lautstärke und den Anschlüssen. 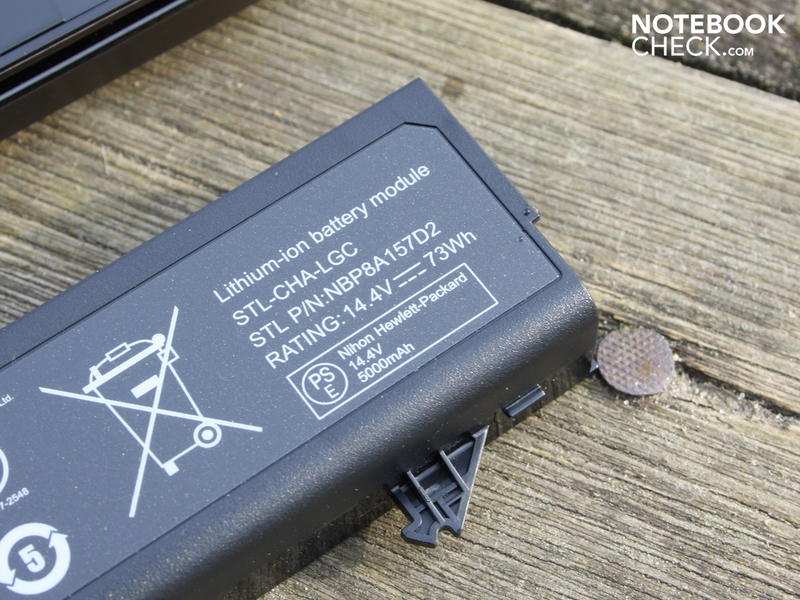 The 55 Wh battery can also be removed for stationary use. It allows 4.30 hours of operation when surfing the internet. HP has come up with several ideas, so that users can only access the components with the necessary knowledge. several screws have to be removed. Then the aluminum panel above the keyboard can be pushed away. After this the base of the hinges is clearly visible. The stereo speakers are also located below the panel. After removing several more screws the keyboard can also be removed. and the RAM (2 sockets DDR3) is possible. The alphanumeric keypad is stabilised by this plate above the optical drive. 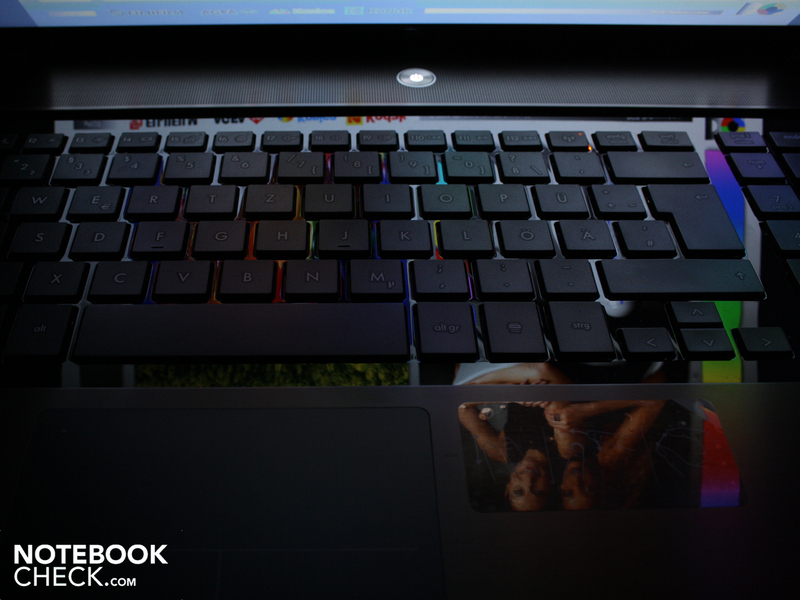 A matte display is obligatory for professionals. This makes working in the sun significantly more pleasant. The 90 Watt AC adapter is relatively heavy with 350 grams. HP doesn't want to abandon the straight power connector. Thus it stands out from the chassis. The price of the 17 inch test device lies at about 675 Euros (retail). 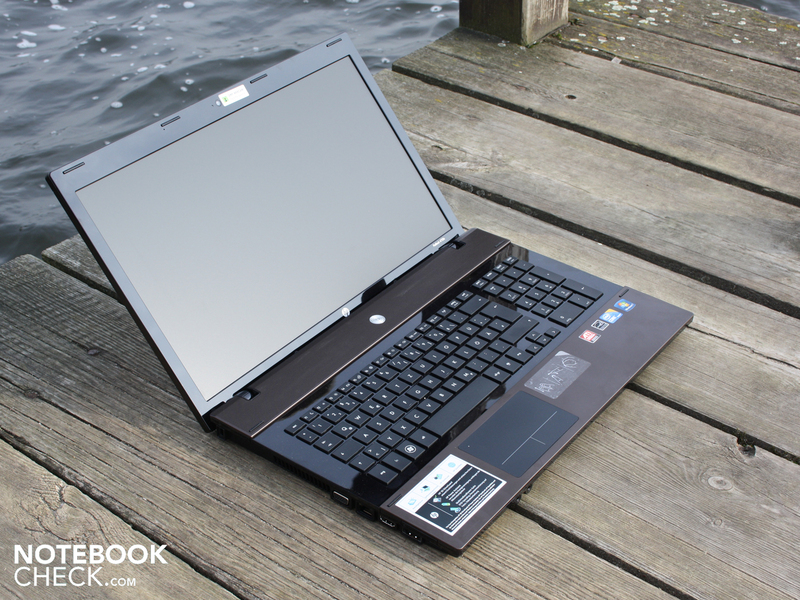 The ProBook 4720s (tested device) and 4520s (15.5 inch sister) can be considered as luxury versions for the consumer segment. Brushed aluminum alternates with glossy black surfaces. 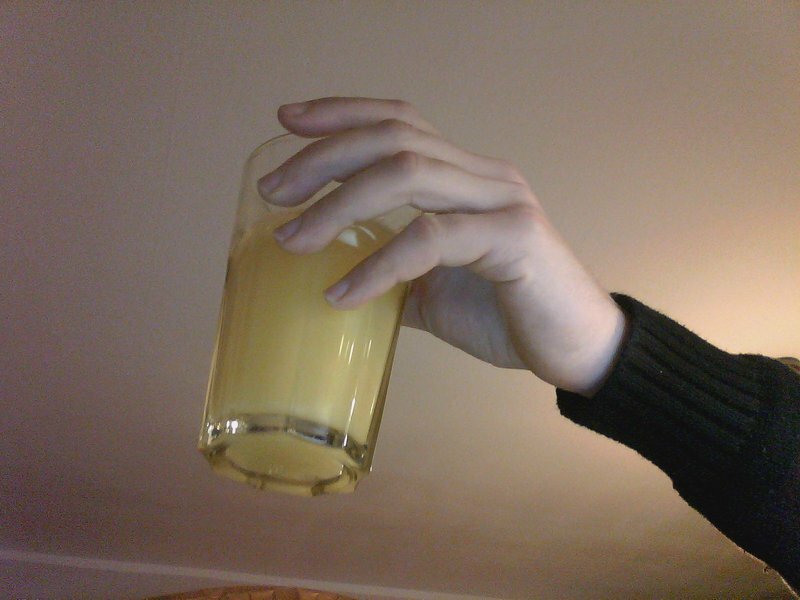 while the 2.0 Megapixel webcam remains almost unnoticeable. The reflecting and soon to be covered in fingerprints spaces between the keys won't appeal to every business user. The technology is pleasing though: A Core i5-460M (2x 2.53 GHz), and a Mobility Radeon HD 4570, power the 4720s. Once again a typical consumer configuration. The 4720s is also a classical consumer when it comes to the interfaces. 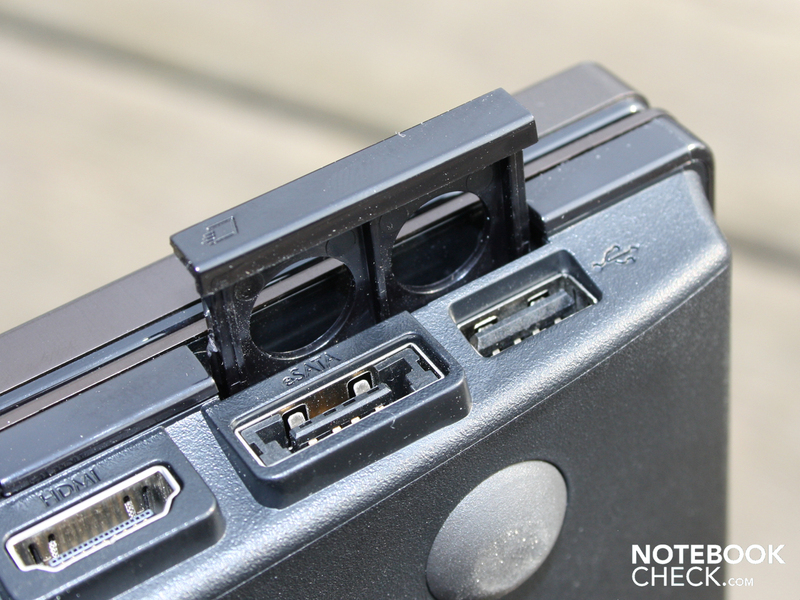 There are no ports at the back, and no docking port, to reduce the clutter of cables. Almost all the interfaces are unfavorably located towards the front on the left and right sides. Clunky VGA, HDMI, or Ethernet cables will make themselves noticeable on the desktop, and possibly also hinder the use of a left handed mouse. 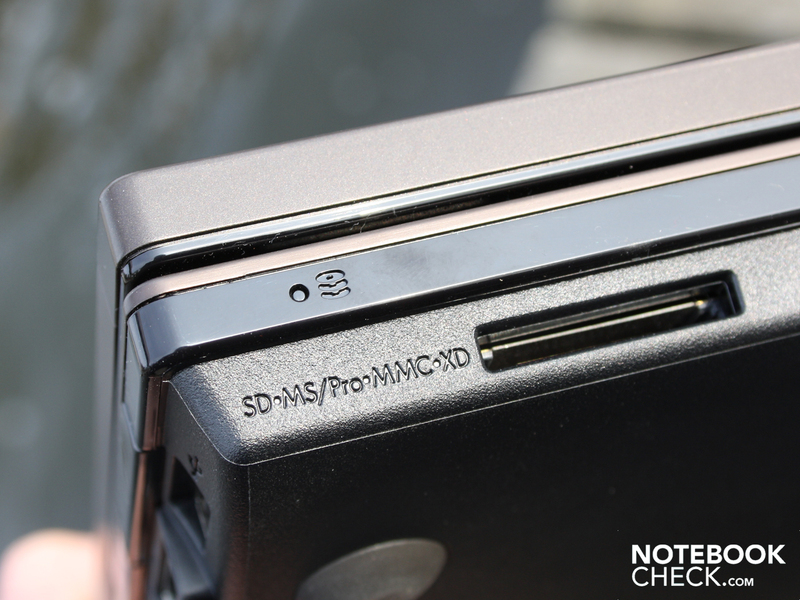 Worth praising is the ExpressCard34 shaft for expansion cards. Under a high and constant load the cooling fan makes quite a racket (air vent). The accessories don't include any media for the pre-installed Windows 7 Home Premium 64-bit. Generous keyboard layout. Cool and stable palm rest. When will there be ports at the back again? The speed of the hard drive doesn't justify its volume. Acer Aspire 7551G: HD 5650 graphics; Toshiba Satellite L670D: more 3D performance but worse input devices; Satellite Pro L670-170: price war from 580 Euros; Dell Vostro 3700: also with i7 quad-core.